Alonso may have the limelight at Indianapolis, but rookie team-mate Jack Harvey is ready to make a splash on the grandest stage in racing. While much of the media hype ahead of this year's Indianapolis 500 has surrounded two-time Formula 1 world champion Fernando Alonso's entry with McLaren, there are another 32 drivers who will take the start of 'The Greatest Spectacle in Motor Racing' on May 28, three of whom are also rookies. Ed Jones made the step up to IndyCar in 2017 by virtue of winning Indy Lights, its premier support series, guaranteeing him entry to this year's Indy 500 as part of a full-season drive with Dale Coyne Racing. Zach Veach was one of Jones' rivals in 2016, and although he ended the year fourth in the standings, the American did enough to clinch the third seat with A.J. Foyt's team for the Indy 500. The third rookie is Jack Harvey, a British racing driver who has been knocking on IndyCar's door for a number of years. Harvey will finally get his shot at the big time in this year's Indy 500 - and of all the people to fight for Rookie of The Year honours, it's not only his team-mate. It's Fernando Alonso. On the grandest of all stages. "Delighted is probably an understatement," Harvey says of the opportunity to race in the '500. "We've worked incredibly hard to try and get to this stage. The way everything kind of progressed getting the deal done with Andretti for the Indy 500 was just honestly more than what I could have hoped for. If we got half of what we ended up getting, it would be incredible. My deal somehow was already good but it just got better and better! "I know it's only one race, but it's the biggest race of the year, at least in America and for sure one of the biggest motorsport events in the world. So to be a small part of that, it's just incredible. It makes the last 18 months which have been very difficult kind of seem like it's been worth it." Born in Lincolnshire, Harvey first made a splash in the UK when he was nominated for the McLaren Autosport BRDC Award in 2010. He followed this up by winning the British F3 title in 2012 before an impressive one-season stint in GP3 in 2013, after which he made the move to America. Harvey almost won the Indy Lights title at the first attempt, tying for points with Gabby Chaves, but missed out with fewer second-place finishes through the 2014 campaign. Harvey was second again in 2015, losing out to Spencer Pigot, but had done enough to prove he was ready for a shot at IndyCar. All he lacked was the funding, something an Indy Lights title success would have guaranteed by virtue of the Mazda Road to Indy scheme. Talks for a full-season seat in 2016 fell through, resigning Harvey to a stint on the sidelines, and although nothing could be firmed up for 2017, a run in the '500 was always on his radar. When negotiations with Schmidt Peterson Motorsports broke down after NASCAR icon Tony Stewart brought in Jay Howard for its third entry, Harvey moved fast to angle for a seat with Andretti. "We started chatting with them and probably within six weeks, the deal was pretty much done," Harvey explains. "They've been an absolute pleasure to work with, so easy, so on it, so straightforward, told us everything they needed, we told them what we would need, and just kind of worked together really well. "We got the deal signed a couple of weeks before the announcement in Long Beach, and then what happened the week after Long Beach made me pretty happy, pretty grateful that we got it done early, that's for sure." The week after Long Beach was when Andretti dropped its bombshell. Its six-car effort had been set privately, with full-season drivers Takuma Sato, Ryan Hunter-Reay, Alexander Rossi and Marco Andretti being joined by Harvey and Stefan Wilson, the younger brother of the late Justin Wilson, who made his debut at the '500 last year. But then Alonso came into the picture. A deal was pieced together between McLaren executive director Zak Brown, IndyCar CEO Mark Miles and Andretti to get Alonso into Wilson's seat, with the Briton agreeing to step back on the condition his sponsors were looked after and he was guaranteed a place on the grid in 2018. The wheels were put in motion, and soon enough, Harvey found out he'd have company as an Indy 500 rookie and IndyCar debutant at Andretti. "I nearly fell off my chair!" Harvey laughs, explaining how he found out. "They didn't exactly tell me who. The team called me on the Monday and said: 'We just want to be totally honest with you, this is kind of what's happening, there's a big guy from Europe coming'. Honestly, my first thought was Jenson. That was my gut feeling. I've met him a few times and know him a little bit. "And then they called me in the morning and said it was going to be Fernando! I was like 'flipping hell'! I can't actually tell you what I said! I just thought it was awesome. Obviously words I never thought I would say, competing against Fernando to be rookie of the year. But again, it hasn't really changed my goals. I'm still going to go out and try and do the best I can. "The opportunity to be teammates with him is incredible. He's been a childhood hero of mine, when he was winning with Renault in Formula 1 and with Ferrari, it was early in my go-karting career. The opportunity to make my IndyCar debut with him as a teammate is incredible. Honestly, I'm just mega excited that I get the opportunity to do it, and just kind of hopeful that I have a good month." Harvey's month at Indy has been mixed thus far. He was the first driver to crash out during practice for the '500 following a failure on his car, and suffered an engine issue ahead of qualifying, where he finished 27th. He rallied on Monday, though, setting the fastest no-tow speed and getting comfortable with his car at just the right time with Carb Day and the race itself to come. While this may be Harvey's first Indy 500, it won't be his first rodeo at Indianapolis Motor Speedway itself. As part of his run to second in the Indy Lights championship in 2015, Harvey won the Freedom 100, the chief support race for the '500. He knows what it takes to win at the Brickyard - but he is refusing to let that cloud his vision heading into the race. "I've won at Indy, I've won the Freedom, but honestly I'm just trying to make sure we're keeping our feet on the ground and going about my day," Harvey says. "I think with Fernando coming he's going to generate a lot of attention so hopefully I can slip off in the background and keep working away at my own stuff. I think it should be a great month for the whole team. "Everybody keeps saying it to me at the moment and I know they're saying it to him as well, you've just got to be there for the last 20 laps. I think if you're running at the front with 10 or 15 to go, I think you're in a good position to do something in the race which is obviously what we're all trying to do. I think tyre saving is a big thing. If you can look after the tyres, it makes everyone a bit more comfortable. If you're comfortable, you're confident. If you're confident, you can push the car a little harder." 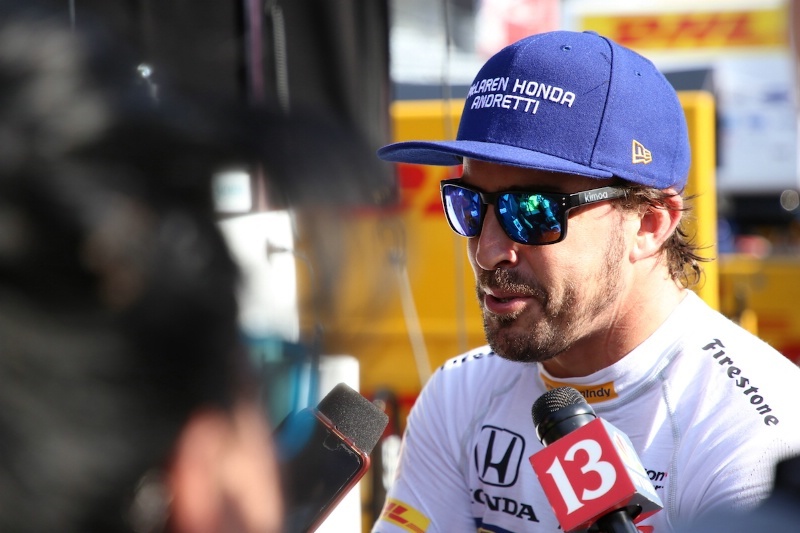 Harvey may be hoping to use the hubbub surrounding Alonso to keep a lower profile at the track, but he is also confident that the increased profile for the race will be a good thing for IndyCar. "I saw the numbers from the weekend, the amount of searches for the Indy 500, and Fernando was through the roof," Harvey explains. "It's generated a buzz about it. I think anyone who said he isn't is kidding themselves. He is one of the biggest names in motorsport. The Indy 500 is a very American event, but a lot of people from Europe have come over and done really well here. "So I think the fact he's still an active Formula 1 driver who's chosen to come and do this over Monaco speaks volumes. I think honestly, the only two other people who could have come over and really generated the same buzz and level of interest would have been Lewis [Hamilton] or Sebastian [Vettel]. "I think it's awesome, I think it's very good for IndyCar as a series moving forward. I think it's good for the '500 and I think it's already generating interest." Such interest could also help Harvey himself, with the British audience for the race set to increase substantially as a result of Alonso's presence. "It's going to be a positive for me," Harvey says. "I think I was mega excited about that. He's one of the best drivers in the world and people are going to be interested in what he's doing. If they see there's me racing, there's Max Chilton racing, they're going to be somewhat interested. "Off the back of that, hopefully we can keep some support from Europe and bring it over with us, which honestly is probably going to come from Fernando, but we're happy to receive whatever support we can get." The enormity of the event is not lost on Harvey. After so many years of hard work both on- and off-track, to finally be taking the start for not only an IndyCar race but also the Indy 500 makes this a flashpoint in his fledgling career. In fact, it's the biggest race of his life. "Absolutely, by a long way," agrees Harvey. "I think this is the biggest race for a lot of people, especially for me because it's my first one, but if you ask any driver in North America what race they want to win, they want to win the Indy 500. Because of that, it makes it the biggest race of the year for everybody. It's exciting." For Harvey, this is a chance to showcase his skills in the biggest event imaginable. Those within the IndyCar community know just how good he is; but this is the chance to come good on that and send ripples right through motorsport, particularly if he can beat Alonso to rookie honours. "Everyone knows that money right now is the driving force still," Harvey says. "If I can go and showcase a good event, do well, be professional, kind of all the usual things that people love to see from a driver, then we are optimistic that it might lead to some more races, it might help generate some more sponsors maybe, at least able to showcase myself to the teams so that if something does happen I can show them I've got a bit of experience and given the opportunity I could do a good job." "I'm well aware of what this could lead to hopefully, but we'll worry about the future when we get there. I think it's important to enjoy what we're doing now and just move forward that way." It is that enjoyment that must not be lost for any of the drivers racing this weekend in Indianapolis. This may be the 'Alonso 500' in many regards, yet there are 32 other stories that need to be told. In Harvey's case, this is the culmination of years of grinding away - and yet it could also just be the very start of even bigger and brighter things to follow once the chequered flag falls on Sunday afternoon.